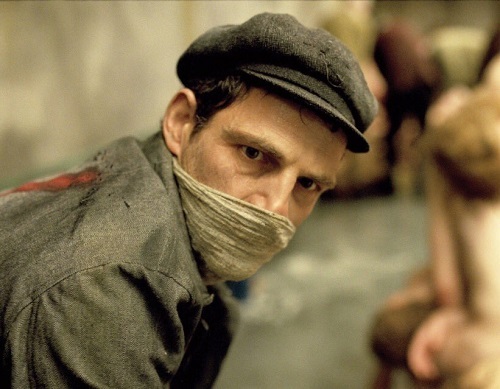 Laszlo Nemes’ stunning debut feature, Saul Fia (Son of Saul) takes its title from central character Saul, a Hungarian-Jewish prisoner at the Auschwitz-Birkenau concentration camp who, in his job as a Sonderkommando, is forced to assist in the grisly day-to-day management of mass exterminations. When Saul witnesses a young boy briefly surviving the gas chamber, he becomes determined to give the child a proper Jewish burial. First-time actor Geza Rohrig provides the focal point for the film as Saul – the camera rarely strays from his character while he negotiates the intricate workings of the camp in an attempt to carry out this dangerous quest. One of the most talked-about films of the last year, this is an extraordinary, gripping and powerful piece of work. This entry was posted on October 20, 2016 by waterfordarts in Film, Garter Lane and tagged Arts & Entertainment Waterford, Film, garter lane, Garter Lane Arts Centre, what's on in waterford, whats on waterford.